I didn't run the Cherry Tree 10m race on Sunday. I was registered for it; I'd picked up my packet earlier in the week; I wanted the ear warmers; I had made plans to meet Kate on the subway at 8:15 in the morning. I woke up at 7am after a bad night of sleep. It was freezing cold out. I live more than an hour away from Brooklyn and the start of the race. I looked at my running clothes all laid out and I said, "Screw it." (Actually, to be honest with you, what I actually said was unprintable, but "screw it" is a very close approximation.) I texted Kate to tell her I was a disappointing loser and I went back to sleep. 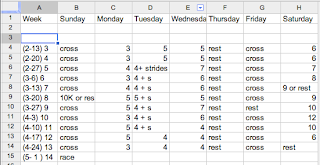 Common refrain that you've seen before on this blog: I'm sick of half-assing too many races. I wasn't prepared to race 10m this weekend, and I chose to DNS rather than to be disappointed with myself. 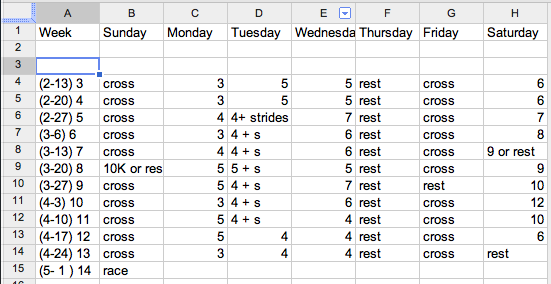 So, instead, I got my sister to create a half-marathon training schedule. She wants me to focus on speed and not distance. Okay, I'll do it. To say that it's low mileage is sort of like saying that the Pope goes to church occasionally. But you know what? If I can't stick to this plan, I'm a deadloss. It's focused around a halfathon on 1 May - possibly the Flying Pig? Then I'm registered for the Brooklyn Half on 21 May. This gives me two chances to feel like I'm somewhat competent/improved at the half. If that doesn't work... maybe I'll just stop racing entirely for a bit. Not a bad idea. Don't go to Cincinnati. Never go to Cincinnati. Oh wait, did I say that out loud? Worst 2 months of my life...ugh. What where/when is flying pig??? I'd be down for another half that doesn't involve running around Central Park... Even if it means a (short) trip outside the city. Ha ha. I didn't see this post before my comment on the full in the previous post :) That looks like a good half plan. Although, it may be all thrown out the window now?